Follow Gemstone IV on Twitter for merchant announcements during the 2018 Ebon Gate Festival. Are the residents of Caligos Isle becoming blind to the difference between good and evil? Or are the lines blurred by the veil of mist that covers the island? He sees. He hears. He grows. Can you resist its lure? There’s only one way to find out. Ebon Gate beckons you. Are you prepared for Ebon Gate? 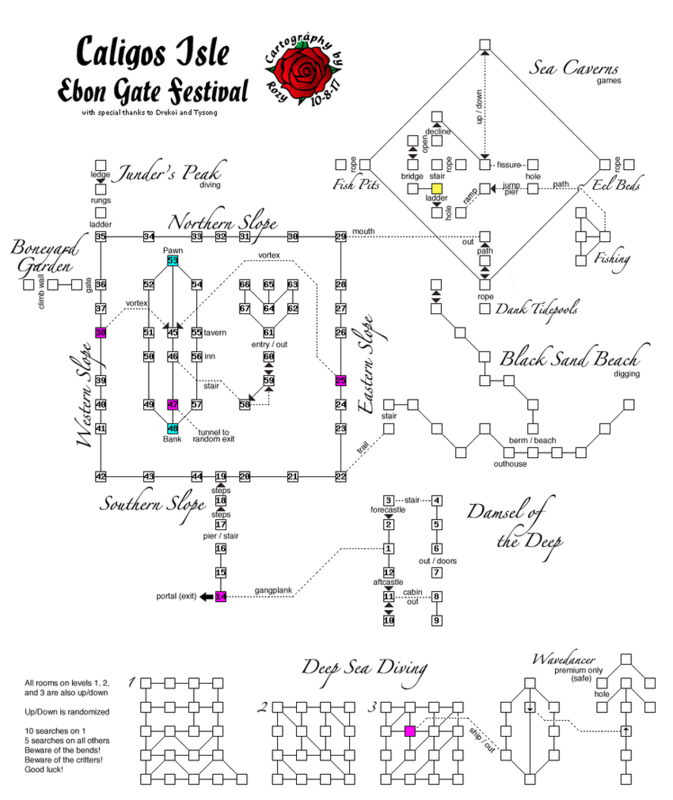 Ebon Gate 2018 opens October 1, 2018, with Caligos Isle as the Ebon Gate Festival area. Once you arrive on Caligos Isle, you will be able to explore at your leisure. Some live games will have limited capacity; you will need a Service & Raffles pass to enter both the live games and GHOUL. † The merchant event is scheduled to be 7 days in each instance (Prime and Plat) as noted in the schedule, but the pass is set up for the duration of the event to cover any mishaps or re-scheduling. For a list of non-jackpot prize items, please see here: Ebon Gate 2018 mini-games prize list. Every year at Ebon Gate gives you the chance to play and experience multiple games and other adventures. 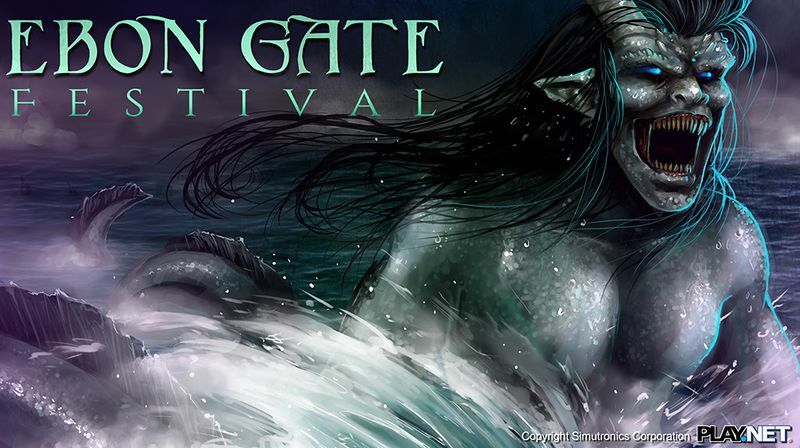 At this year's Ebon Gate we have digging on the beach, various games of luck, and Deep Sea Diving. From said adventures you have the chance to pull great prizes. These prizes range from junk to one of a kind unique items. Deep Sea Diving, Games, & Digging - All pull from the same shared feeder. Deep Sea Diving is the main source for quest items, but a number of quest items have been placed in the regular games hoppers. Quest items will not be found in fishing. All automated games (Mini-Games, Digging, Deep Sea Diving, and Fishing) share the unique/jackpot feeders. Dig along the black sands of the beach, and unbury long lost treasures! NPCs available along the shore's edge will sell shovels in convenient 1-use and 20-use sizes, which cost 2,000 and 40,000 silvers, respectively. A few Mini-Games can be found in the sea caverns, and will require that your pockets jingle with silvers in order to play. Mini-Games are not compatible with notes, so fill your pockets will silvers! Both Digging and Mini-Games participation will require a Games Pass, available in the SimuCoin store. Passes are account-wide and are good for one week's play time. See the Deep Sea Diving article for additional information specific to that activity. See the Caligos Isle mini games article for additional information specific to that activity. It will cost 50 Ebon Gate seashells to enter the fishing area (a games pass is not required), and top tier unique/jackpot rewards pull from the same shared feeder as the activities above. Once inside, (make sure you take your fishing gear with you! ), you will remain until you catch a fish. After a successful catch, you will be removed from the room. Caught fish will need to be CUT to receive your prize (and maybe a filet). Fishing will yield items that are not found in other games, but can produce both Unique and Jackpot items. Fishing does not require any specific skill, though a bit of survival may help you cut out a filet. General knowledge of the fishing system will help, as fishing can be a bit time-consuming, especially when unfamiliar with this activity. You will need a fishing pole, fishing line, and bait, all of which can be found in the Fishing Shack down on the pier in Caligos Isle, though you're not required to purchase items from this shop - ANY fishing pole/wire/bait will function the same. Fishing is the exclusive place to obtain the required item for conversion to Ghezresh. Those who do not want to convert will have an alternate path if this item is found. This item is also tradeable. Have you ever wanted to jump off a cliff and perform the most perfect and beautiful swan dive? Or would you rather curl up your body and crash into the water like a cannonball? Now you can! And, you'll be scored on your efforts. The top five divers at the end of the festival will be known forever as a Caligos Diving Champion (a post-name unique title). This activity costs 50 seashells. It does not tie into the prize feeders, but it does offer some unique gems that are not available in other games. A partial list of gems can be found at EG Diving Competition Gems. Here's a small list of some things you might find as a jackpot win while playing mini-games, digging on the beach, diving in the Abandoned Waters, or fishing in the sea caverns. Use QUEST TRANSPORT EBON to transfer to Caligos Isle from any town, or use the portals listed below. This page was last modified on 18 October 2018, at 17:28.